I love blog posts about the magic of ordinary days. You know the ones that expound upon the grit in our daily lives as if it’s some sort of fairy dust sprinkled over us that makes everything perfect and wonderful. This blog post is about the true nature of grit. If you have ever owned cats or know anything about their personalities, you know they are thieving, little devils. They develop weird passions for things like pens, pencils, Q-tips, etc. Basically, anything they can swipe off a table, out of a cubby in a bathroom cabinet, or from the trash. My three cats (Henry, Simon, and Freddie) crave pencils especially if I’ve placed an eraser cap on the end. They usually chew off the eraser that comes with a pencil (I have found gnarled pieces of metal left as evidence of their handiwork) necessitating the addition of an eraser cap. I believe they work in concert to ensure this happens, and then they celebrate by waiting until I go to bed to work the pencil out of the jar in the living room, the wire spiral of my notebook, or from the side of my laptop cooling station. Looking for one of my lost pencils is what prompted this blog post. I was on my hands and knees in the kitchen with the three offenders watching my progress as I laid my head parallel to the floor to peer beneath the printer table. I spied a popcorn kernel, and my mind flooded with memories of teaching Joshua how to make popcorn on the stove. I retrieved the kernel and sat back on my knees as I recalled what a great day that was and how many more like it we’ve had since. But I didn’t find the pencil. I looked into the corners of the fireplace mantel also in the kitchen. A two by three piece of grey Lego was wedged behind the antique wood. It has been years since my kid played with Legos. He started by building every kit according to instructions, but his best creations were those he made up without the benefit of a pattern. The Titanic with a removable panel to simulate destruction by an iceberg, the Iron Giant, a mask similar to that worn by General Grievous, an M1 Garand that ejected the clip, a three-level ship longer than my kitchen table, and a working crossbow were among my favorites. Still no pencil. Under the stove I found a cap from a bottle of Leinenkugel’s Summer Shandy. How my cats managed to get the bottle cap was beyond me, but its discovery prompted the memory of a wonderful, teen-free evening spent with my husband. The night was outrageously hot and the light beverage tasted delicious and refreshing. Husband and I felt like newly-weds again as we whiled away hours in each other’s company doing absolutely nothing and loving every moment. Again, no pencil. I crawled all over the house looking for my pencil. I could have simply used another one, but it was a matter of principle now. The cats trailed me with mild interest, and I swear they nodded their heads toward their litterbox as if suggesting I look there. Little creeps. I eventually found my pencil inside the cooling station where a clumsy paw had pushed it in an effort to snag it off the table. I threaten to beat their hides every time one of my pencils goes missing, but I have to admit the process of looking for it adds to my memories most positively. 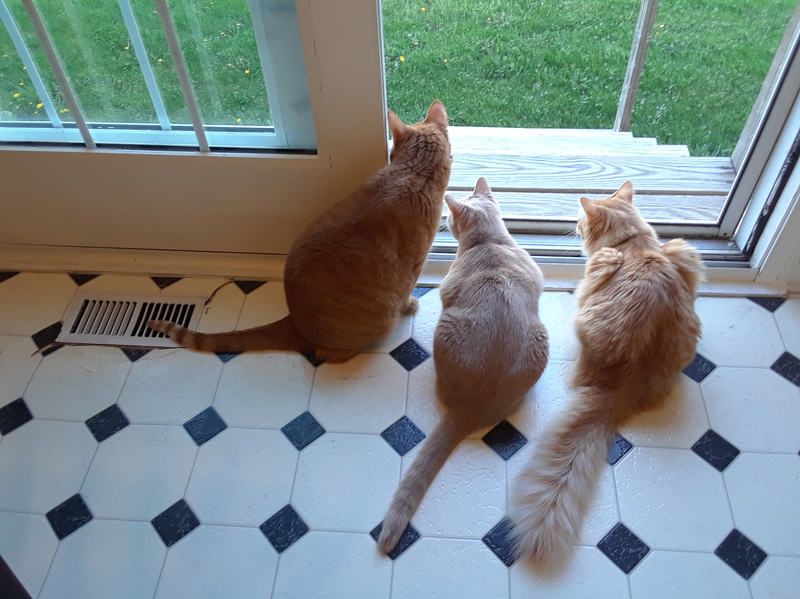 Someday—hopefully not in the near future—my broken heart will reminisce Henry, Simon, and Freddie, and I’ll be most appreciative for the days they decided to steal my pencils. My theory: God gives us teenagers to let us know what it’s like for Him when dealing with us. If I hadn’t heard His voice every single time I corrected Joshua, I would never have come to this conclusion. And because I’m the adult, the parent, the smart one who has lived more than twice as long as my child, I have it all together and nailed it the first time, right? Wrong. I’ve grumbled, complained, whined, begged, pleaded, made deals, and sulked my way through life just like a teenager. God—being the great parent that He is—never backed down. Discipline and guidance came my way whether I wanted it or not. The lessons flowed from God to me to Josh, and still I didn’t catch on. Until one day last week when I had a moment of brilliant insight. I had been moping because I received my first rejection notice concerning the novel I’m currently querying. 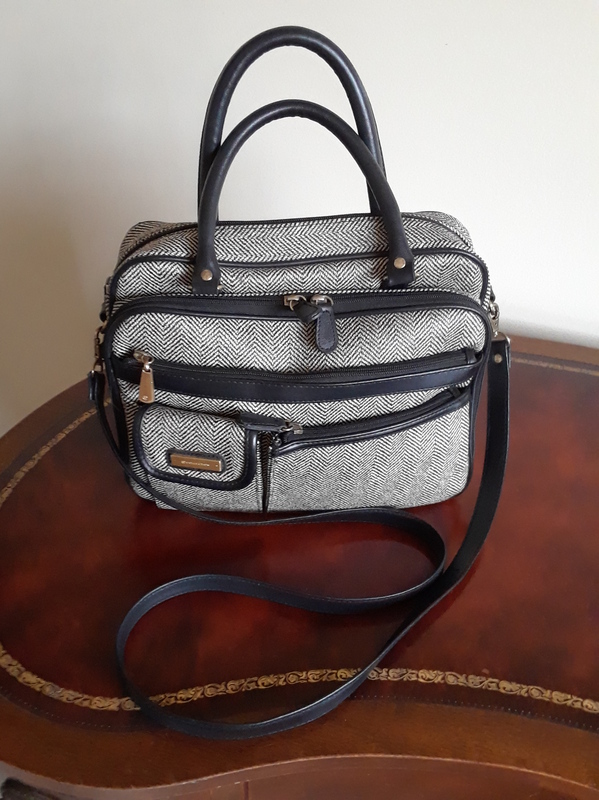 Instead up getting right back up in the saddle and sending out another query, I sat in a chair at the kitchen table and sulked. It was a most unproductive day until my teenager came home. While Joshua may be a sluggard when it comes to picking up the dirty socks on his bedroom floor, he’s a drill sergeant when it comes to my writing. Without further comment, Joshua pulled out the chair with me in it, used a karate hold on me that put my arm behind my back, and led me to the computer at the other end of the table. Before you become upset thinking that he hurt me, please be assured that we laughed throughout the whole process. No bullying was involved as my son strong-armed me out of the doldrums and into positive energies. It worked. Here’s the key: I knew better than to resist the karate hold because it was a real one he learned on his way to becoming a red belt. It didn’t hurt at all when Joshua helped me from the chair and gave the instruction to get back to work. If I had pushed or leaned in any direction against the hold, it would have been painful, and that’s when it hit me. God’s instructions only hurt when I resist them. Finally, I’ve learned my lesson. Will I always apply it to my life perfectly? Probably not, but that doesn’t let me off the hook from trying. Just as I expect Joshua to strive for new levels of maturity in his life so, too, am I expected to stop behaving like a child, grow up, and pass the lesson forward. I’m writing my blog post for Memorial Day one day late because most Americans were busy yesterday with picnics and parades. That is certainly not a criticism, so please don’t take it as one. In fact, my hope for every person reading this post was to have been surrounded by loved ones doing the activities you enjoy. But again, quite a few of us were busy yesterday, so I hope you have time now to read what I write because it may present information of which you were not aware. Did you know that the Civil War, which ended in the spring of 1865, claimed more American lives than any conflict in the history of the United States? 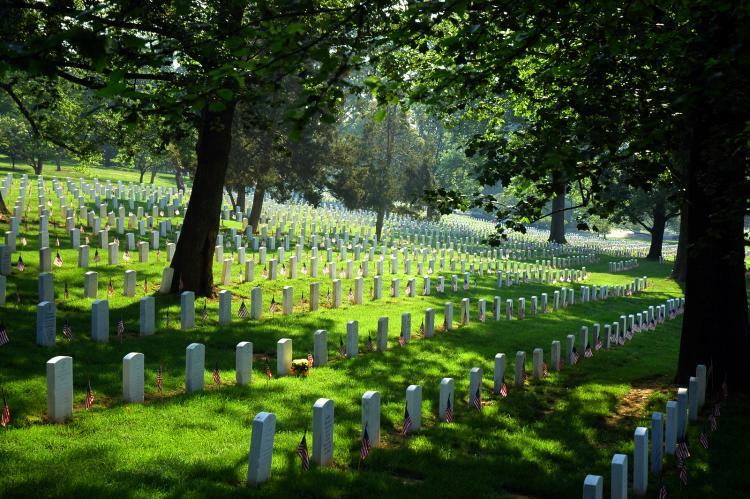 The first national cemeteries were established to provide final resting places for the many soldiers who died in the war. Americans began the practice of decorating these fallen soldiers’ graves with flowers and reciting prayers during springtime tributes in the late 1860s in various towns and cities. No one is sure where this tradition originated because different communities may have started the memorial gatherings independent of neighboring towns. In 1966, the federal government declared Waterloo, New York as the official birthplace of Memorial Day. Waterloo first celebrated memorial services on May 5, 1866, and the town was chosen because it hosted an annual, community-wide event. All businesses closed and residents decorated the graves of soldiers with flowers and flags. These days, businesses stay open and Memorial Day is often seen as simply marking the beginning of summer. Most Americans wish each other Happy Memorial Day, but I’m not quite sure that’s appropriate. And at the risk of becoming a little more somber, let’s not forget that the day came out of a conflict in which brother fought against brother. Still, if I make you pause for just a moment to realize how blessed America and Americans are, then I’ll take the risk. War is never good, and America is not perfect. But since we have Memorial Day, I’d like to offer some suggestions on how to observe it. Cub Scouts and Boy Scouts decorate the graves of local soldiers with American flags. I’m sure they’d gladly welcome non-Scouters who wish to honor the fallen. Visit nursing homes and seek out veterans. Use caution when talking about their war experiences, but by all means, encourage them to talk about whatever interests them. Keep in mind that your own neighbors may be veterans, so offer to cut grass, cook a meal, or run errands for them. Please don’t rule out young veterans. They have needs, too. Remember, not all wounds are visible; use love and wisdom in every situation. Don’t forget the family of soldiers who are currently serving. Your kind words and offers of assistance will go a long way. It doesn’t take a lot of money to show compassion. Babysitting, washing dishes, or simply visiting a lonely spouse will help to ease the void left by a serving soldier. And since we’re Americans, and everyone knows Americans love their pets, don’t forget to walk the dog or brush the cat of a serving soldier or elderly or disabled veteran. Widows and widowers of fallen soldiers may be the hardest to detect especially if you weren’t already aware of the fact that she or he was married to a soldier. When you do find out, gently encourage the surviving spouse to remember their fallen loved one. 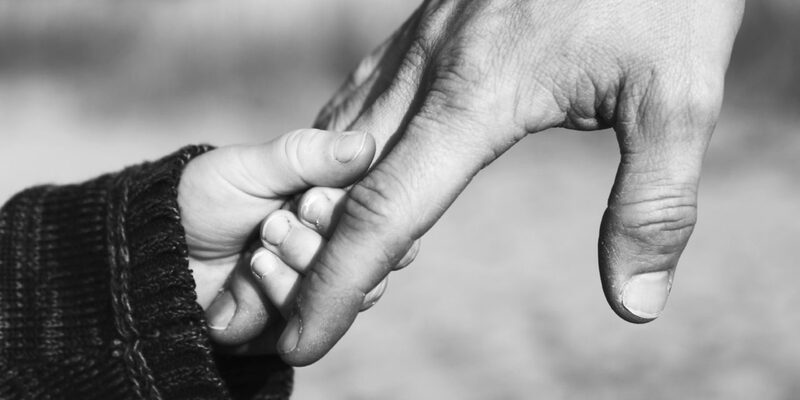 Sharing memories is a great way to work through the grieving process. When you see a stateside soldier, shake his or her hand and offer thanks for his or her service. If you’re able, offer to buy that cup of coffee he or she just ordered, the lunch he or she sat down to eat, or his or her groceries on the conveyor belt ahead of yours. And if you’re not able, consider giving your place in line to the soldier behind you. I hope this doesn’t come across as preaching. These are just suggestions, and I’m sure you can come up with many more. The thing is, it isn’t just on Memorial Day but rather every day that we need to be serving each other. I have to remind myself more than I care to admit that I should be serving others. Memorial Day is one of those days, not unlike Thanksgiving, when I’m reminded to do just that. Well, we finally did it! The hubby and I survived high school. We made it through all four years and came out the other side relatively unscathed. There were some bumps and bruises along the way in the form of forgotten homework, mad dashes to school with hastily packed or forgotten lunches, and most recently, the delivery of two loads of cardboard that entirely filled the back of hubby’s SUV to the school our son attended in the afternoon for Civil Engineering and Architecture. Oh, did you think I meant hubby and I survived our own high school years? No, no, no… I’m talking about our son, Joshua, and how despite all the snark thrown our way (and that’s when he was actually communicating) we are now the proud parents of a high school graduate. Man, did that go quickly. I put him on the bus for kindergarten on Monday, and he graduated on Friday? When I dressed him for school, he had on shorts, a striped t-shirt, and sneakers that lit up when he ran. He loved those shoes. What came home that last day wore a backpack bigger than he was when he started school and sneakers longer than the bus. His sense of fashion didn’t change much. He still leans toward t-shirts, but if you ever see him in shorts it’s only because someone pulled a prank and cut off the legs of the sixty dollar jeans he conned out of his grandfather. I have vague memories of a little kid who never ordered anything to eat except “chickie fries” suddenly being the young man whose stately walk into the auditorium and perfect pivot at the aisle deposited him at his seat where he promptly clasped his hands behind his back like a Marine standing at attention. And after the ceremony, the only way I could spot him among the sea of blue and white caps and gowns was to look for the face that had once been soft and round and was now square and chiseled. I can recognize that jawline anywhere. Leap past the graduation dinner at his favorite restaurant to all of us fast asleep in bed that evening. Everyone except me because my mind and heart aren’t quite sure if I’m supposed to be happy or sad. I believe that mix is called melancholy. Add to it a dash of “what do we do with this young person now,” and you will be standing outside the fence of the ballpark in which hubby and I are now playing. Perhaps you are familiar with this scenario, but Joshua is our one and only. We won’t even have the opportunity to apply what we learn to another child. As I sit here typing this, watching him brush his teeth in the kitchen sink like some kind of animal, I have to wonder how we did with him. Is he truly ready to be unleashed on the public? How much will his behavior reflect on us? Is it too late for Catholic military boarding school in Siberia? Does he love us? Does he even like us? I suppose we could have done this instead of that. More of A and less of B. Chosen what was behind curtain one as an alternative to taking what was in the box. Would it have made a difference? Life is not a dress rehearsal, so who can really say? I made a promise to infant Joshua to never lie to him no matter how many times he asked me the same question as a toddler (it’s true that airplanes don’t fly when it’s too cold). I tell teenage Joshua that I’ll pay for any therapy needed due to emotional scarring endured while cleaning his bedroom. Sometimes I wish we had a crystal ball so we could see where all this is heading because it feels like we’re riding a roller coaster in the dark. There are times when I think that’s a good thing because there will be no witnesses when I push Joshua out of the car. But most days, I cling to him in case there is a sudden drop up ahead that none of us can see. We know he wants us to loosen our hold on him for the thrill of rising out of the seat on the dips and hills. And we will… once we check that he secured his seat belt for life. I am seriously considering the switch to disposable plastic cups. I originally wanted to do this because both of the men in my house, husband and son, are notorious for grabbing a clean glass when they have one right in front of them. 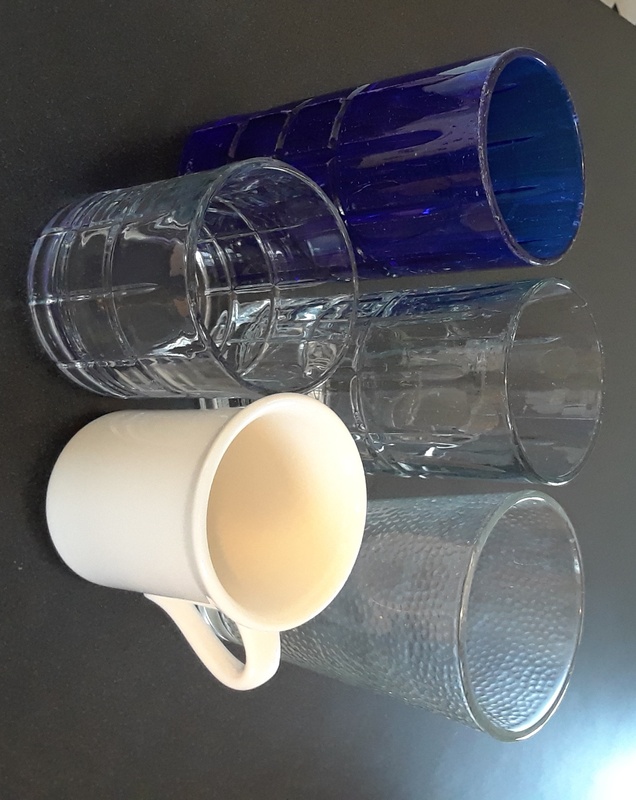 The amount of dirty dishes they produce in a day is staggering, but at the forefront of the parade of crockery and glassware marching into my dishwasher is always the humble tumbler. They recently earned a reprieve in my campaign to get them to reuse a glass when illness took America in its grip. Just today I logged on Facebook to see that several more friends were either succumbing to the creeping crud or finally recovering from it. Because I am somewhat of a germaphobe, I granted husband and son amnesty during the periods of sickness that took down the Gibson Household not once, not twice, but three times. But my men, God bless them, aren’t always diligent in following my gently applied guidelines when it comes to glasses. For example, I love to keep a glass by the sink full of ice cubes and fresh water so I can grab a drink whenever I’m thirsty. We don’t own one of those fancy refrigerators with water and ice magically spewing from the door, so this practice served me well until my son decided to indulge himself in my thirst quenching drink. I cannot tell you how many times the water-thieving twerp has guzzled my beverage moments before I reached for it. Adding insult to injury, he left the empty glass full of ice cubes right where I placed it. Husband, on the other hand, is actually quite good about not drinking from my glass except that he forgets which glass is his and exactly where he set it. His mistake results in another lecture on the evils of the “community glass” replete with examples of how drinking from someone else’s glass is just plain gross. “Oh, I drank out of that one,” says the son who came home from school with the sniffles. Big sigh as I empty that glass and place it in the dishwasher. Then I fill another glass, this time one with a lovely pattern resembling tartan plaid cut into the glass, and fill it with ice and water for me and me alone. Except this is also the pattern of the glass husband, who is recovering from illness, has decided upon, and now he can’t remember where he set his glass, and maybe he drank out of mine, maybe not. Two more glasses enter the dishwasher to prevent the spread of germs. Three new glasses are procured for dinner, all different in pattern and color, and we agree to keep an eye on them for later use. Except my guys don’t, and to make matters worse, they cleared the dinner dishes, mixed up our glasses, and forgot which belonged to them. So you see I simply have to switch to plastic for the good of all mankind or at least to maintain my sanity. The run on drinking glasses became so bad that we started using mugs. Not that this kept my boys from mixing up which one they had used to begin with. And I even caught the younger one drinking from mine again. I had to abandon my lovely glass (or mug) of chilled water waiting for me on the sink in favor of all three of us grabbing a fresh glass (or mug) every time we wanted a drink. And let me tell you, we’re water drinkers at the Gibson Household…which I suppose is a good thing especially when one is trying to push fluids during an illness. But seriously, I’m switching to plastic cups. 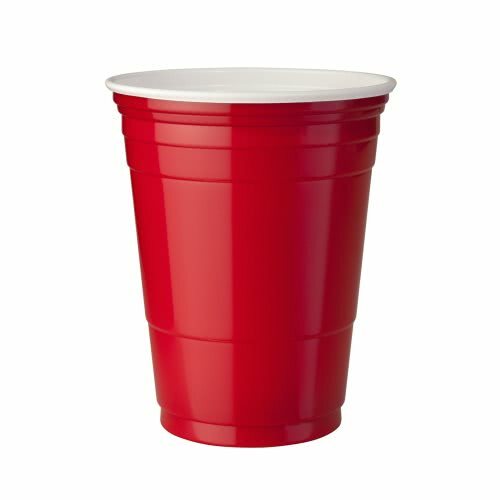 It’ll be me and Solo against all the tree-huggers who claim the popular red receptacle is a hazard to landfills. I can no longer play Jacob in trying to sort out the speckled and striped glasses and who drank out of which one. Procter & Gamble will no longer receive my money for countless boxes of dishwasher detergent every two weeks. Now, I will support Dart Container in my effort to stamp out germs. The last recipe I’d like to share with you from our Hanukkah celebration is one that always popped up in church cookbooks. Unfortunately, those old cookbooks are disappearing and no one seems to produce them anymore. I held on to this recipe and tweaked it a little by using raw sugar in place of white and dark brown sugar instead of light brown. The changes make for an even richer cake that still receives lots of praise. Not to mention I love pulling out this old recipe to share with people who’ve never tasted it. I made this cake to share at my writers group. Even though a few ladies took two pieces, there was plenty left for my boys. And then it was game on. They ate it for breakfast with coffee, as a midday snack, and again after dinner. I had to battle them to get a piece myself. The only thing to do was make another which worked out for me as I needed one more blog post this week. 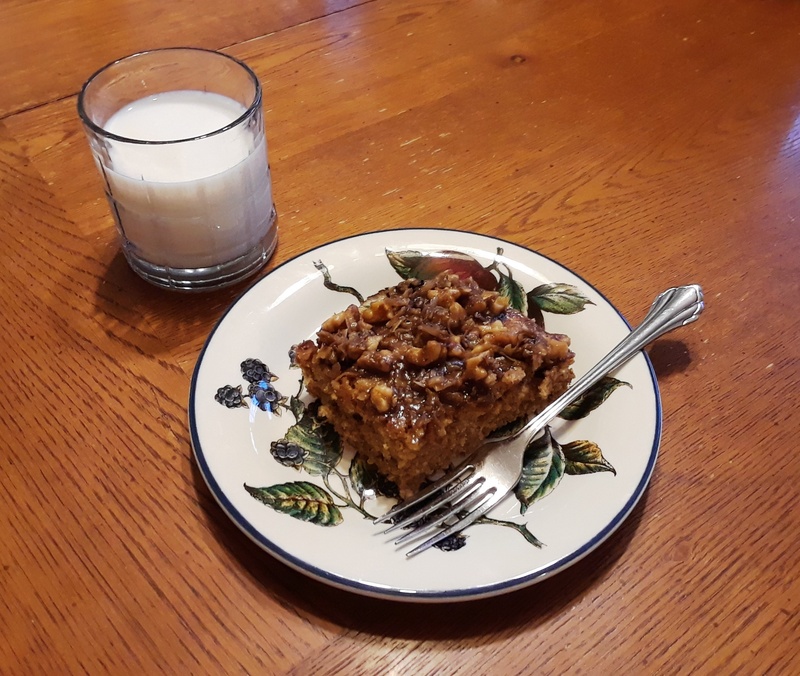 This easy, delicious cake would be great on Christmas morning while opening gifts or to have on hand for when friends stop by during the holidays. The ‘everything mixed in one bowl’ batter and topping along with ingredients one almost always has on hand makes you look like a culinary genius when the guests taste that first bite. Pour the boiling water over the oats and allow them to stand for 20 minutes or until the water is absorbed and the oats are cool. Using a handheld mixer, cream the butter, both sugars, eggs, and vanilla. Add the oats and mix thoroughly. Sift the flour, salt, soda, and cinnamon. Add the dry ingredients to the wet mixture and blend well. Pour the batter into a 9 x 13 inch pan that has been greased or sprayed with cooking spray. Bake at 350° for 35 to 40 minutes. A knife inserted in the center should come out clean. Five minutes before the oatmeal cake comes out, prepare the topping mixture. Mix all ingredients together and spread carefully over the hot cake so as not to tear the surface. Work with small dollops of topping. Heat from the cake will melt the butter and sugar as you spread. There’s nothing quite like a well-seasoned turkey coming to golden-brown perfection in my roaster to bring tears to my eyes. The smell alone reminds me of my Grandmother Smith, God bless her, clomping around her kitchen (she was not the most graceful) tending to the Thanksgiving turkey and many side dishes in preparation for dinner. I mentioned in another post (When Maturity Strikes) that our son, Joshua, earned his first turkey at his first job. 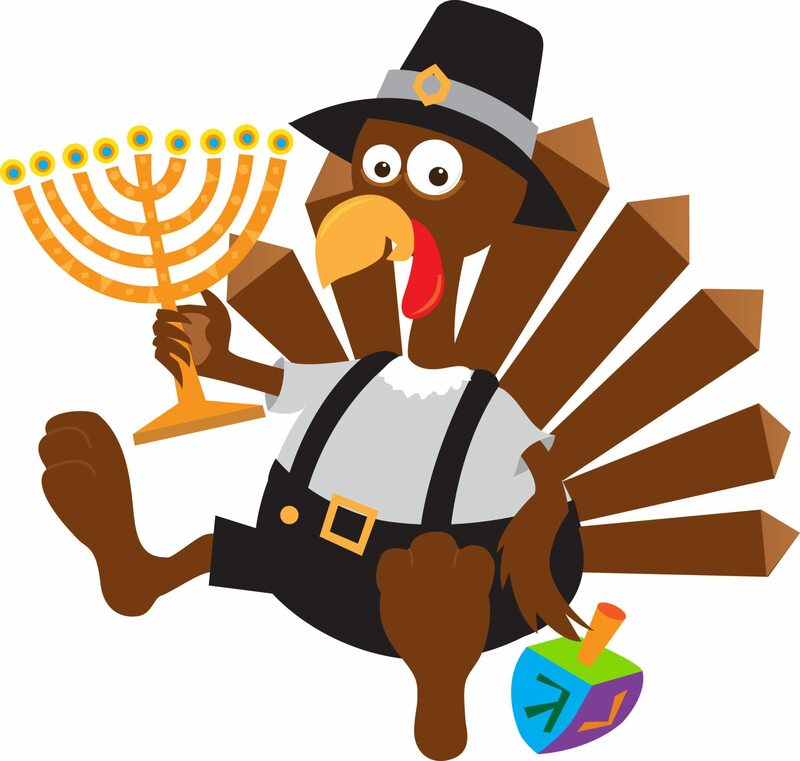 My husband received a turkey from work for our Thanksgiving dinner, so Joshua willingly saved his for Hanukkah. He quizzed me on my intended preparation including seasonings and made me promise him that it would turn out juicy. Based on the way we ravaged the poor bird, I believe I achieved success. Here’s the kicker: I don’t have a single picture of this culinary masterpiece. My recipe is classic, simple, and tasty. I know deep frying, brine baths, and flavor injections are popular, but I chose to keep it teenager-friendly. It was, after all, his turkey. I started with a fully defrosted turkey that I rinsed, trimmed, and patted dry. You will not need the giblets, neck, liver, gizzard, or heart for this recipe. I worked with the turkey breast side up in my roaster. Mix all the seasonings except the paprika. Dip the cold pats of butter into the seasoning mixture on both sides and gently shoved beneath the skin of the turkey. Use your fingers to separate the skin from the meat enough to place the butter. Two pats on each side of the breast for a total of four, and two beside each of the legs also totaling four. You will not use all of the seasonings for this. Rub the surface of the turkey with the softened butter. Sprinkle the surface, taking care to get the legs and wings, with the remaining seasoning mixture. Sprinkle lightly with paprika. Cut the ends off the lemons and quarter them lengthwise. Place all eight sections of lemon and the peeled garlic cloves in the cavity of the turkey. Tuck the wing tips beneath the turkey so they don’t burn. Add two cans of chicken broth to the roaster. Do not pour them over the turkey, or the seasonings will be rinsed off. How to Roast is a good guideline to follow, however, keep in mind there are slight differences between cooking in a roaster versus an oven. My advice is to stay with your turkey if it’s your first time and also because you’ll want to baste it throughout the cooking process. Once your turkey is cooked to golden-brown perfection, allow it to sit for ten minutes before serving and carving. **If you don’t have a half tablespoon measure, the equivalent is 1 1/2 teaspoons. As we continue our Hanukkah celebration, I have to laugh because yet again the Gibson Household is experiencing What I Like About Being American. By that I mean we enjoyed another, non-traditional yet delicious meal. We love to include the best a culture has to offer, namely their food. 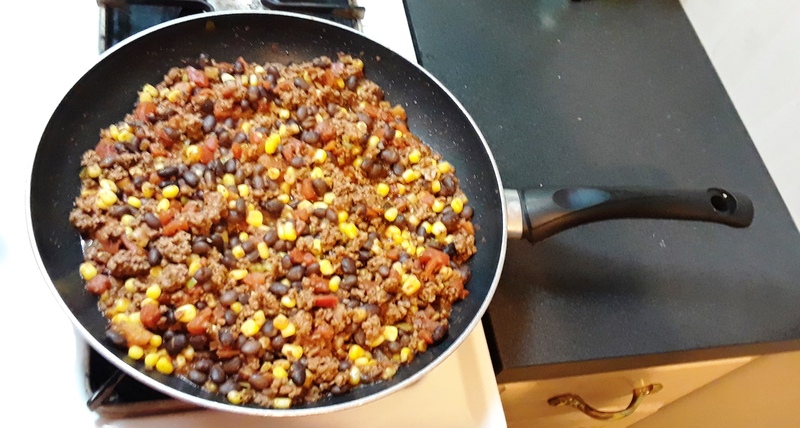 Mexican Family Skillet was invented a few days before I was due to grocery shop, and I needed to extend a pound of ground beef to feed and satisfy two hungry men as well as myself. A little scrounging through my pantry shelves and spice cupboards, and a new dish was invented. I don’t doubt that it’s a much Americanized version of Mexican cuisine, but the blending of cultures through food produces peace in a way that is often overlooked. While it may sound too common to be served for a holiday, it still draws my family together over dinner, and that’s what really counts. Cook the ground beef in a skillet with the onions until the meat is no longer pink. Drain the mixture thoroughly and return to the skillet. Add the black beans, corn, and tomatoes with their juice. Stir to mix. Add the spices, stir, and heat through. Serve the meat and vegetable mixture in tortillas. Top with cheddar cheese. Sour cream, guacamole, or chopped avocado is optional. Here at the Gibson Ranch, we like to step outside the corral of meat and potatoes to try a little something different. 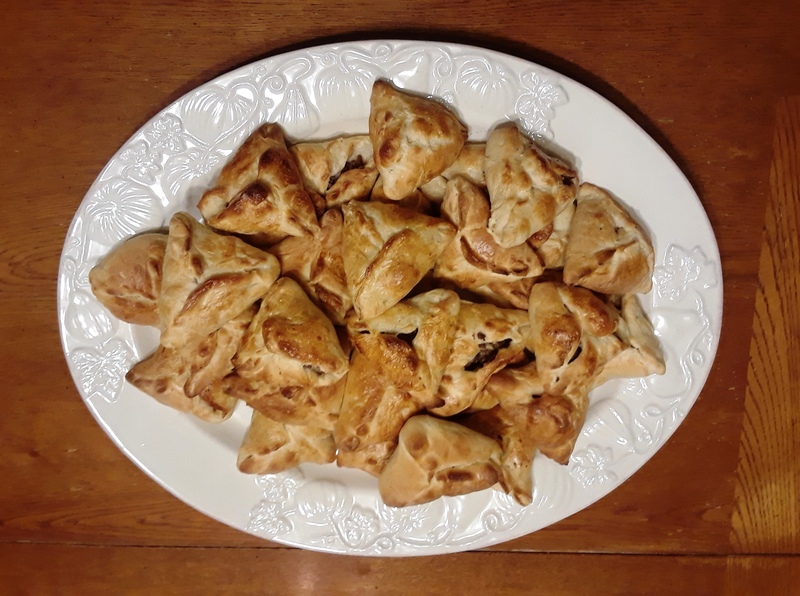 For Hanukkah this year, we indulged in one of our favorites: Lebanese meat pies. They’re perfect as an appetizer, a side dish, or even a main dish. It’s all a matter of perspective, what you’re serving them with, and how many you want to eat! This easy recipe is a great introduction to Middle Eastern cooking. I’m sure you’ll end up making it part of your holiday traditions, too. Prepare the dinner rolls the night before. Place them on baking sheets coated with cooking spray taking care to leave room for rising. Cover with plastic wrap also coated with cooking spray and place the trays in the refrigerator. 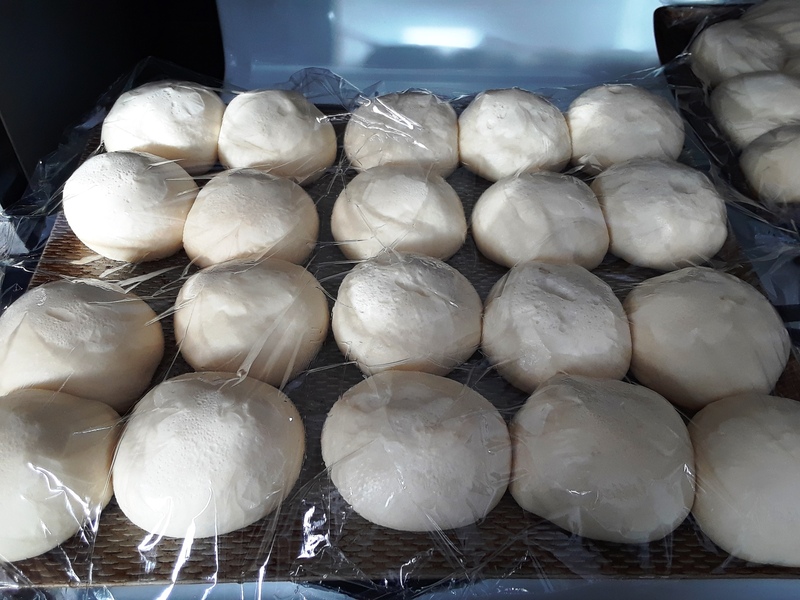 The rolls will defrost in the refrigerator, but you will need to let them rise at room temperature until they are at least doubled in size. When the rolls are ready, preheat your oven to 450° degrees. Toast the pine nuts in a toaster oven at 325° for 5 minutes stirring at least once. Pine nuts burn easily, so start with 5 minutes and only cook in additional minutes, if necessary, until they are golden. You can do these in a conventional oven, but keep an eye on them. Set aside to cool, and then chop or grind coarsely. Dice the onion and place it in a skillet with the ground beef. Cook until the meat is no longer red and the onions are translucent. Drain thoroughly; there will be quite a bit of liquid. Return the meat/onion mixture to the skillet and add the lemon juice, salt, pepper, cinnamon, and allspice. Stir to mix and warm through. To assemble the meat pies, take one roll, stretch it out round, and place a spoonful of meat mixture in the center. Fold one side in toward the center, and then fold up another side. Pinch the seam shut between the two sides. Fold up the third side, and pinch the other two seams shut as well. You will end up with a triangular-shaped pie. Some people bake them seam down, but I’ve always baked them seam up. If your seams are secure, I’ve found it really doesn’t matter. Brush the sealed pies with beaten egg white taking care not to rip them open. Bake for 10 – 11 minutes until golden brown, ending up more on the golden end of the color spectrum. Depending on your oven, you may go 12 – 15 minutes, but do not burn the bottoms or overbake the tops.